CherrySue, Doin' the Do: Family Road Trip ~ North West UK ~ Part 2 Liverpool! Family Road Trip ~ North West UK ~ Part 2 Liverpool! Welcome back to our family road trip across the North West UK. 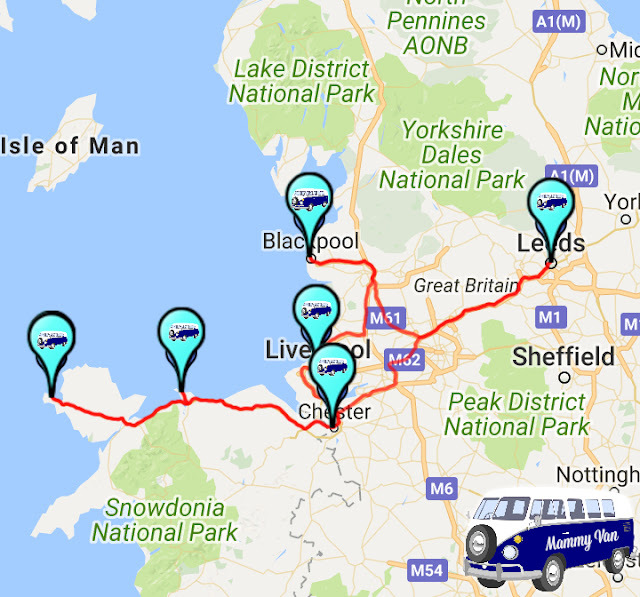 Last week I told you about Llandudno in North Wales, after we whooshed down the side of a mountain on a toboggan we buckled our 5 little ones back into Mammy Van for the 1 hour and 20 minute drive to Liverpool. As we were doing a budget trip we chose Holiday Inn Express John Lennon Airport about a 20 minute drive from Albert Dock. Surprisingly enough for an airport hotel I didn’t once hear any airplanes! 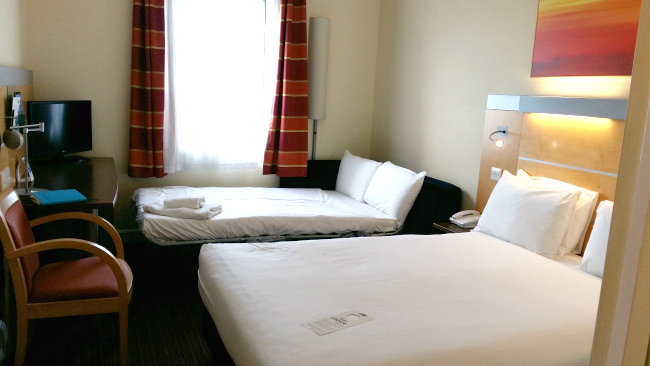 We were on the 5th floor & the rooms were perfectly clean and comfortable. Continental breakfast with some hot options is served in the open plan reception area on the ground floor. We stayed for two nights costing £67.50/€73.45 for 2 adults & 2 kids per night B&B. What to do in Liverpool? 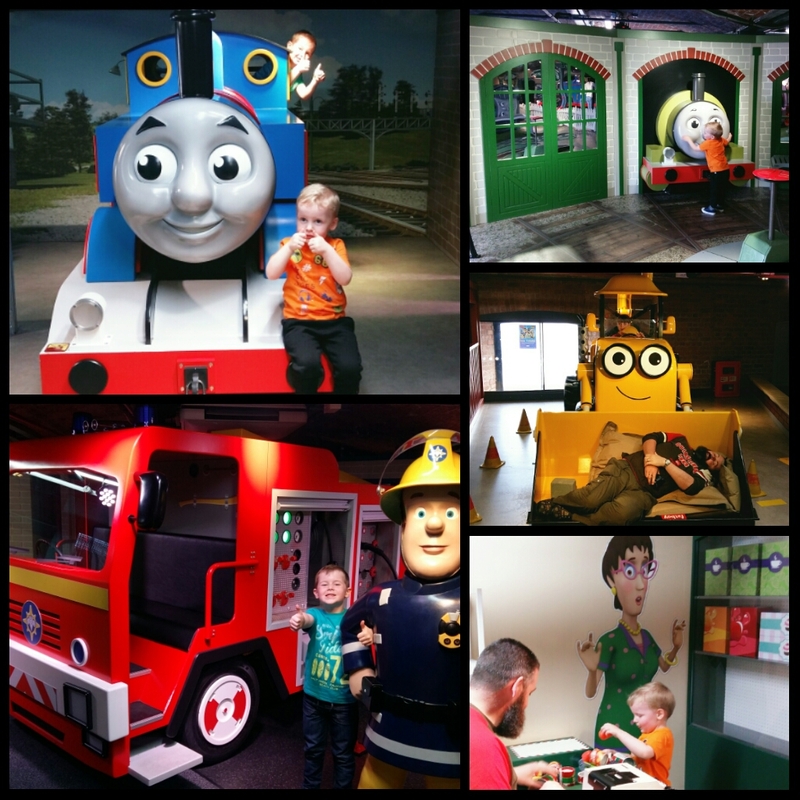 While researching what to do in Liverpool for kids I couldn’t believe it when I came across Mattel Play located in Albert Dock. It’s every child’s dream spread over two floors. There’s a full size Thomas the Tank Engine that the kids can hop on to have a play, a ball pool and a mini loco ride in the Thomas & Friends themed area. We moved onto the Bob the Builder area where my son Cillian’s eyes nearly popped out of his head when he saw a full size Scoop, he donned a hard hat & Hi-Vis vest before he hopped in! Lorcan, aged 2 couldn’t believe it when he saw a full size Jupiter & Fireman Sam (or as he calls him Ham)! The lads were in their element playing with Titan & Juno before a quick visit to Dilys’ shop. Our visit was complimentary. 2 hours of play costs £10/€10.88 for children aged 12 & under, babies under 12 months are admitted free while adults’ tickets cost just £2/€2.18. Further information is available HERE. My kids are mad about the Beatles simply because one of them found a couple of Beatles CD’s in the house & insisted on playing them in Mammy Van while we were on a road trip a few months ago, since then they’re hooked on the Fab Four. No better place to bring them than The Beatles Story in Albert Dock. It’s actually spread across two buildings a short walk apart. 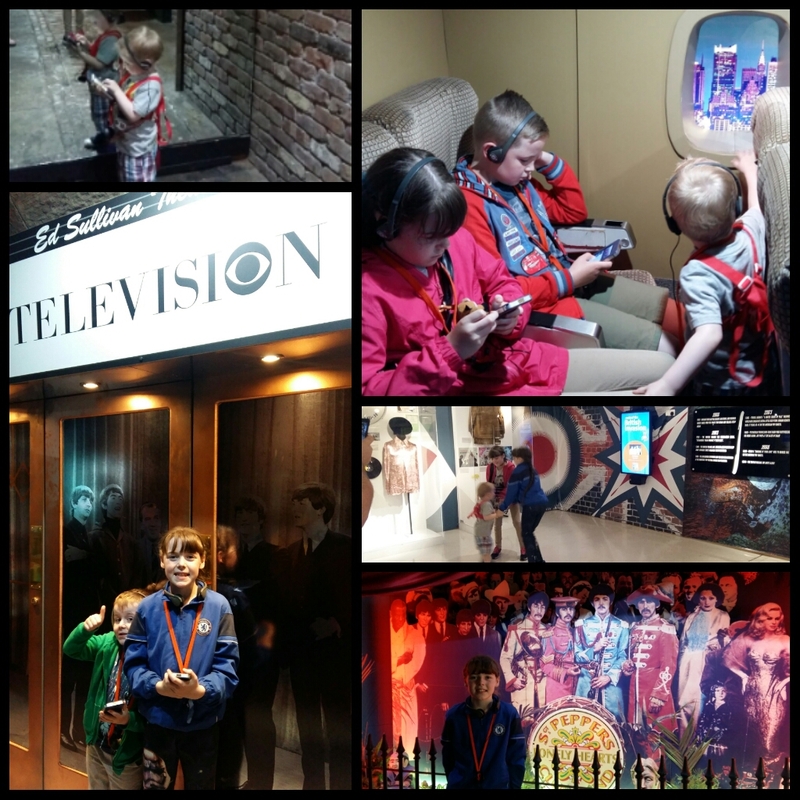 We started our tour in the main building in Albert Dock, using audio guides we learned the history of the Beatles, how they formed and all about their early day’s right up to becoming a worldwide phenomenon. We then walked the 10 minutes through Albert Dock to Pier Head to learn about The British Invasion. If you don’t fancy walking or it’s raining you can jump on the red sightseeing tour bus free of charge on production of your Beatles Story ticket to get to Pier Head. We had a great time & the kids danced their way around the buildings! Our visit was complimentary. Adult tickets are £15.95/€17.35, kids tickets are priced £9.50/€10.33, there are also a discounted rate family tickets available which vary in price depending on the size of your family. For more information click HERE. A member of our Mums on the Run (with or without the little ones) Facebook group gave us an excellent tip for travelling. Check Groupon for the country you intend to travel to. Genius! 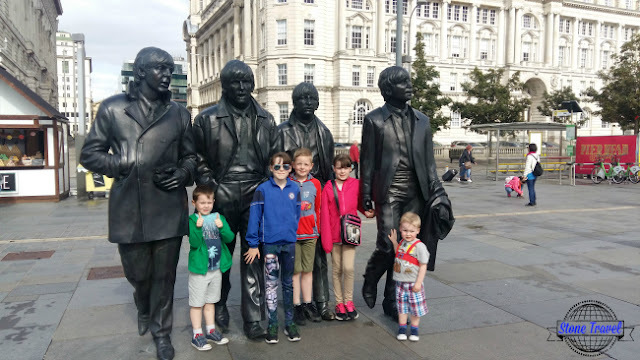 So I quickly looked up Liverpool & found a Beatles tour bus for just £19.50/€21.21 for a family of 5, as I was looking a pop up gave me a discount code so I got the family ticket for just £15/€16.32, children under 5 years old travel free of charge. I didn’t realise until we got there that the ticket covers two different routes and they gave us a 48 hour ticket instead of a 24 hour ticket. 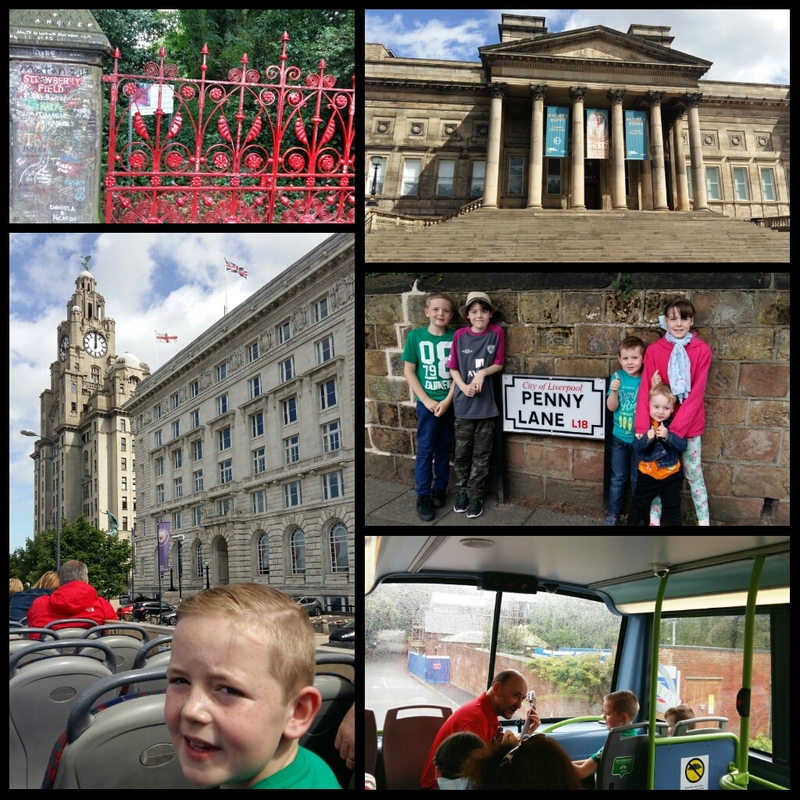 One route is an hour long Liverpool sightseeing route that we enjoyed but the other 2 hour long Beatles Tour bus with a singing tour guide was fantastic! He explained the meaning of the lyrics of Penny Lane & Strawberry Fields as we passed by the places mentioned in the songs, we even got to hop off for a photo at the Penny Lane sign and again for the Strawberry Fields gates. Back on board the bus my little ones were thrilled when he produced a guitar & asked Seamus (9) to hold the mic while he sang Penny Lane; they joined in with gusto as did the rest of the tour bus. The deal is still available on Groupon HERE. As we have 5 little ones and didn’t want to park far away we opted for the easiest car park at Albert Dock. Car Park B is a barrier operated car park right beside the tour bus stop & a stone’s throw from The Beatles Story. Parking there costs £4.50/€4.90 for every 2 hours. For more information & directions visit their website HERE. I wanted to bring my little ones on a ferry across the Mersey as the famous song goes as I did it as a child & remember it to this day, unfortunately on the day we were there the ferry was not operational due to technical difficulties. I was looking at their combo ticket on their website that offers exceptional value, a 50 minute river explorer cruise where you learn about Liverpool’s famous waterfront combined with a visit to the U- Boat Story at Woodside Terminal and Spaceport at Seacombe terminal for an unbeatable price of £35/€38.07 for a family of 2 adults & 3 children. Kids under 5 years old travel free of charge. As Woodside terminal was closed the U- Boat Story was also closed so we didn’t get to visit we did however get to visit Spaceport where we took a journey through space. For more information click HERE. 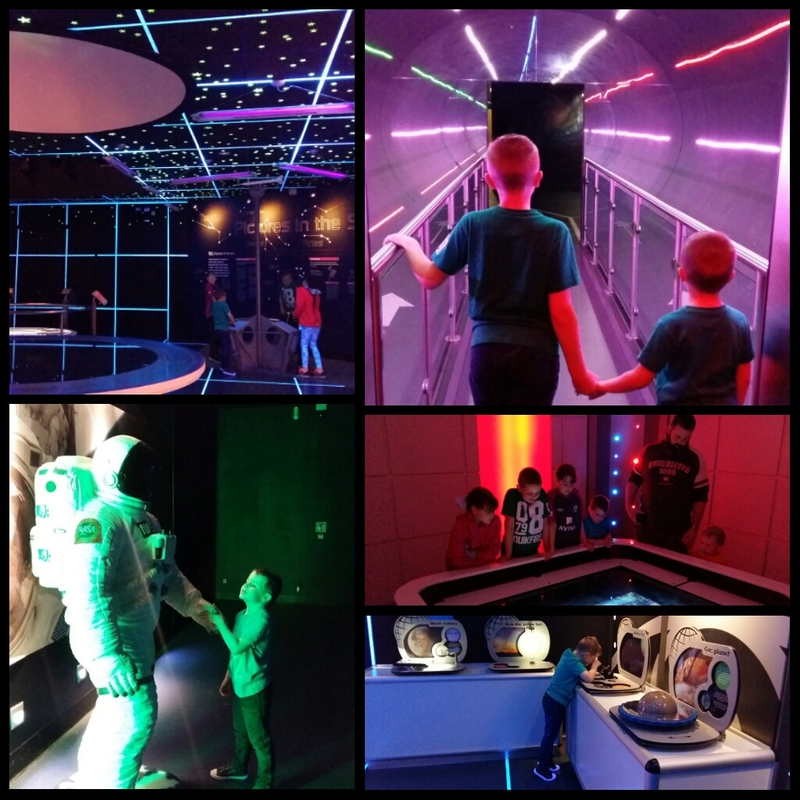 The exhibition is spread over two floors with lots of hands on learning for little ones, we loved the planetarium a 360° dome where we watched the 25 minute movie. The kids had great fun on the Explorer 1 space ride; it’s like a rollercoaster simulator, so there were plenty of squeals & giggles. We didn’t spend long there but it was brilliant and well worth a visit. Our visit was complimentary. A family ticket costs £24/€26.11 for 2 adults & up to 3 children or you can get it as part of the combo tour above. There you have it our 2 days in Liverpool with kids, have you visited with kids? Is there something we missed that you would recommend for our next visit? Pop back next week for all the details about Blackpool Pleasure Beach! The Beatles Story and Spaceport. I was not asked to write this review.